Book Launch continues — where I’ll be — and free book offers! Thanks to you all for making this last week one of the most memorable weeks in years. Honestly, there is nothing like seeing the dream come to life, no matter how often I’ve visualized it. I’ve got a few more appearances scheduled, and quite a few guest blogs, including book offers. Join me if you can—and spread the word if you’d like. Tonight, Thursday, August 15, from 7-9 p.m., I’ll be speaking to the Authors of the Flathead, a multi-genre writers’ group in Room 151 of Ross Hall (Science and Technology Building) at Flathead Valley Community College in Kalispell. My primary topic is blogging, but we’ll leave plenty of time for questions on anything related to writing and book marketing—and yes, I’ll have books! Next Friday, August 23, at 2:00, I’ll be giving a book talk and signing at Touchmark, formerly Waterford, at 915 Saddle Drive in Helena. Some of you know my mother Alice—this is the senior community where she lives. If you’re nearby, come help me share the celebration with her! On line, today I’m interviewed by writer Edith Maxwell at Wicked Cozy Authors, comparing the view out west with that of my New England writer friends. 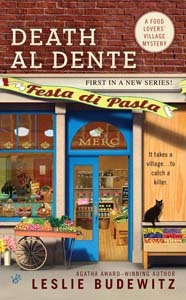 Leave a comment for a chance to win a copy of Death al Dente. All this week, I’m the featured author on the Barnes & Noble Mystery Bookclub. I’ll admit, that’s especially fun because the wonderful customers of B&N made me a national bestseller last week—Death al Dente was #11 on the mystery list for mass market paperbacks (the small format) and #44 on the overall fiction list in that format. Champagne flowed at our house! And finally, book champion extraordinaire Barbara Vey is giving away a book a day on her blog, and if I filled out the form right, Death al Dente‘s turn is Saturday, August 17. I hope you’re having as much fun this summer as I am — can you believe it’s the Ides of August already? My advice: pour a glass of something, stretch out in the shade, and open a good book. And if you need a suggestion, well, I have one! This entry was posted in Food Lovers' Village Mysteries, Guest Blogs -- Leslie elsewhere by Leslie Budewitz. Bookmark the permalink.